Most people’s idea of diving involves reckless jumping and shameless showing off, often followed by serious injury. Competitive diving however is a beautiful and acrobatic sport that is remarkably safe. Competitive diving is an athletic competition event whereby divers jump into water from a raised platform whilst performing various acrobatics. Although associated with swimming watersports, successful divers have characteristics more in common with gymnasts, and as such are judged not on speed but on form, execution and degree of difficulty. The sport is divided into springboard and platform disciplines, each with varying heights and each possessing their own unique manoeuvres and difficulties. Competitive diving is particularly popular as an Olympic event, where it first appeared in 1904 under the quaint name of ‘Fancy Diving’. The poor safety record of diving as a whole is largely weighted down by the number of accidents caused by irresponsibles jumping from bridges, piers, cliffs or the swimming pool diving board, without giving much thought for the potential risks. 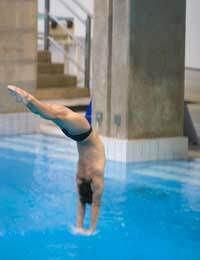 Competitive diving however is a remarkably safe sport, attracting very few incidents due to its well-regulated and supervised practise. For instance there are some diving programs that will not allow their students dive into the pool for up to a year, preferring instead to teach essential core skills using dry land instruction, with facilities such as a trampoline and spotting harness. Typical injuries associated with competitive diving are usually the result of mistiming jump-off manoeuvres, so that the diver comes into painful contact with the springboard or platform on the way down. The water entry is the other key risk point. The water impact force achieved from high dives can be significant and if the dive is ill timed can result, in extreme circumstances, in neck and spinal injury. Well trained divers are nevertheless well prepared for these risks. For instance they carry out training to strengthen the vulnerable neck, back and shoulder areas. Finding an experienced coach and good diving program is much more than being able to learn a particular diving skill, it’s about safety. Diving coaches are licensed professionals whose overriding aim is to ensure the safety of each of their students. A dramatic triple somersault will impress the judges but not if the diver takes a nasty tumble in training beforehand. Beginner divers considering getting involved in the competitive sport should first consider a few basic rules of safe and successful diving. Before taking a leap it is important to first consider the depth of the water being dived into, paying particular attention to whether it is deep enough to accommodate the height of the dive. Naturally the higher the dive the deeper the water needs to be. Also make sure there are no hidden obstructions. Experienced competitive divers can often be seen practising a straight vertical-entry dive into the water, however, due to the great speed and depth of this dive it is not a safe style for beginner divers. Novices should instead begin by practising ‘steering up’ – arms extended over the head with hands flat and aiming up and with head up and back arched - when diving, to help steering up away from the bottom of the pool. The extended arms and hands not only help in steering the body away from the bottom of the pool and back to the surface but also in protecting the diver’s head from hitting the bottom. The key to diving successfully is maintaining control. Beginner divers need to learn and rehearse the core techniques from the start so they eventually to use them automatically. For instance less experienced divers often lose control of their dive through improper use of their hands and arms and so should practise holding their arms extended, with hands flat and tipped up.